"Deadly secrets emerge from the shadows when the full moon rises!" 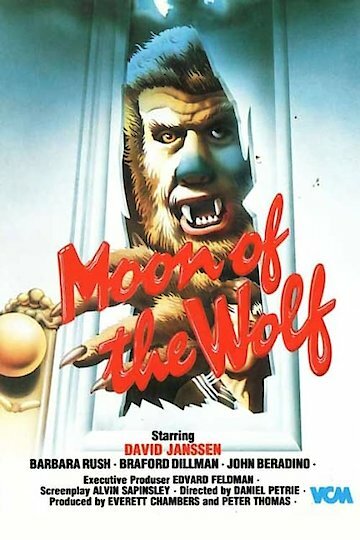 The made for TV movie Moon of the Wolf was produced to be part of the ABC movie of the week series that ran throughout the 1970s; the script uses the novel Moon of the Wolf by Leslie H. Whittan as its inspiration. Directed by Daniel Petrie the movie uses the conventions of the werewolf horror movie genre to tell a story of the occult set in the southern U.S. state of Louisiana; Moon of the Wolf uses the large French speaking population of Louisiana as its main suspects in the investigation into a murder. Moon of the Wolf uses the character of Sheriff Aaron H. Whitten, played by David Jannsen of The Fugitive as its central character investigating a brutal murder. A young woman is found murdered on the land of two farmers at the opening of the film and the Sheriff called in to investigate. The brother, Lawrence of the murdered woman claims she was having an affair with a man she refused to name; during the investigation into the murder the town's doctor is revealed to be the lover of the murder victim. The victim's father explains to the Sheriff that he should be careful of a creature with a French name that cannot be translated by anybody in the town. The Sheriff later moves his investigation to a local plantation owned by Andrew Rodanthe and his sister Louise; Whitten begins to have suspicions that Andrew was somehow involved in the murder. These suspicions are set aside when the doctor is revealed to be the lover of the murder victim and Andrew is appointed a deputy to the Sheriff. Finally the father of the murder victim has his warning translated to be a warning of werewolves in the area. Sheriff Whitten now faces a race against time to unmask the identity of the werewolf before it can strike again. Moon of the Wolf is currently available to watch free on Tubi TV and stream, download, buy on demand at Amazon Prime, FlixFling, FlixFling VOD, Amazon online.